The former Adare Courthouse is an impressive stone building at the roundabout in the centre of this pretty village, where I stopped for lunch in yesterday afternoon [24 May 2018] on my way to speak at the launch of Patricia Byrne’s book in Limerick. The courthouse in Adare was built in 1863, when its construction was financed by the 3rd Earl of Dunraven. It was designed by the Limerick-born architect William Fogerty and was built by M Walsh of Foynes. 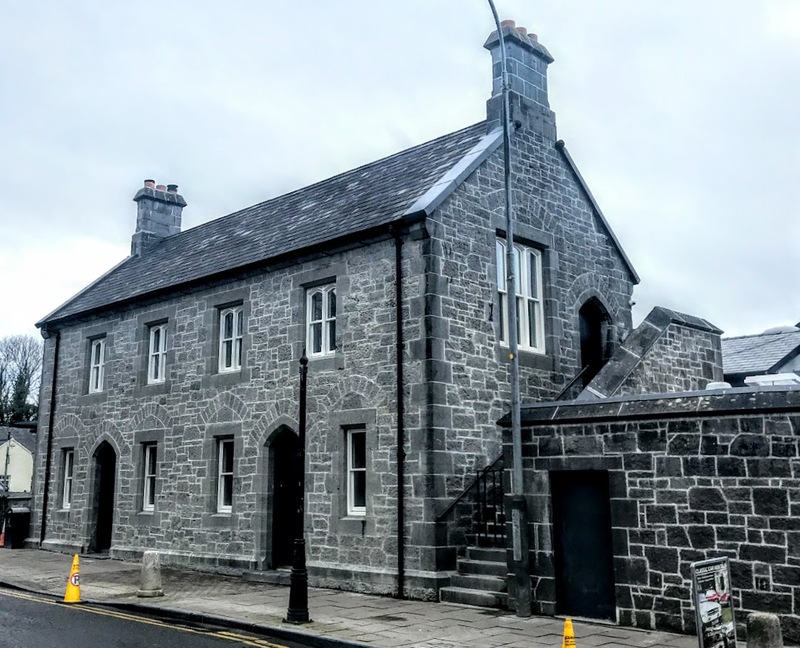 The former courthouse is a Gothic-style two-storey building, built of cut-stone external limestone walls and a pitched slate roof, with cut limestone copings and cut limestone chimney stacks. For many years, this protected structure had not functioned as a courthouse and was closed to the public until recently. But it was bought last year  by the publican Charlie Chawke. Since then, it has been restored, with the ground floor incorporated into the neighbouring Aunty Lena’s bar and restaurant, and with a courtroom museum on the first floor that was opened last night. This is a detached, six-bay, two-storey former courthouse. The symmetrical façade gives the appearance of a pair of houses, each with three bays and a central door. The domestic element is further underlined as the building was designed to accommodate a caretaker on the ground floor and with a constable’s room at the same level. The unadorned limestone construction adds a certain austerity to the façade which gives the building a civic dimension. The austerity might have been relieved by the proposed clock tower that was part of Fogerty’s original plans. 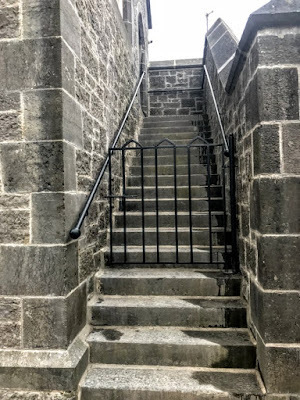 The fine stonework adds artistic interest and is indicative of the quality of craftsmanship used when it was being built. The building and its associated boundary walls make a notable addition to the streetscape and architectural heritage of Adare and it has additional significance because of its close links with local history and the Earls of Dunraven. William Fogerty (1833-1878), the architect, was born in Limerick, and practised in Limerick, London, New York and Dublin. 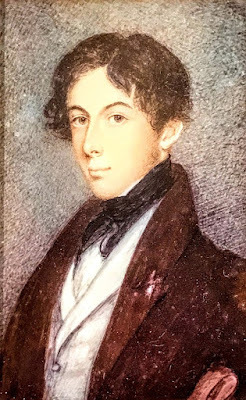 William was a student at Queen’s College, Cork, in 1850-1851, when he drew up a plan by CW Law for a new road to the college. He began practising as an architect in Limerick with his father in the 1850s, and was working from 97 George’s Street, Limerick, in 1861-1863, when he designed the courthouse in Adare. His other works in Limerick include the Protestant Orphan Society Hall, the apse in the former Holy Trinity Church, Catherine Street, and the Tait Memorial Clock in Baker Place. He moved to Dublin in 1863 or 1864, and he was working from offices at 23 Harcourt Street when he was elected a Fellow of the Royal Institute of Architects in Ireland (FRIAI) in 1863 and a Fellow of the Royal Institute of British Architects (FRIBA) in 1868. The courthouse was used for sittings of the district court in Adare until 2009. Last night, the new museum on the first floor was opened to the public, and the ground floor is incorporated into the bar and restaurant at Aunty Lena’s. Different sections are labelled with names that recalls the past use of the building, such as ‘The Cell,’ and the wall are lined with legal-themed paintings and cartoons. 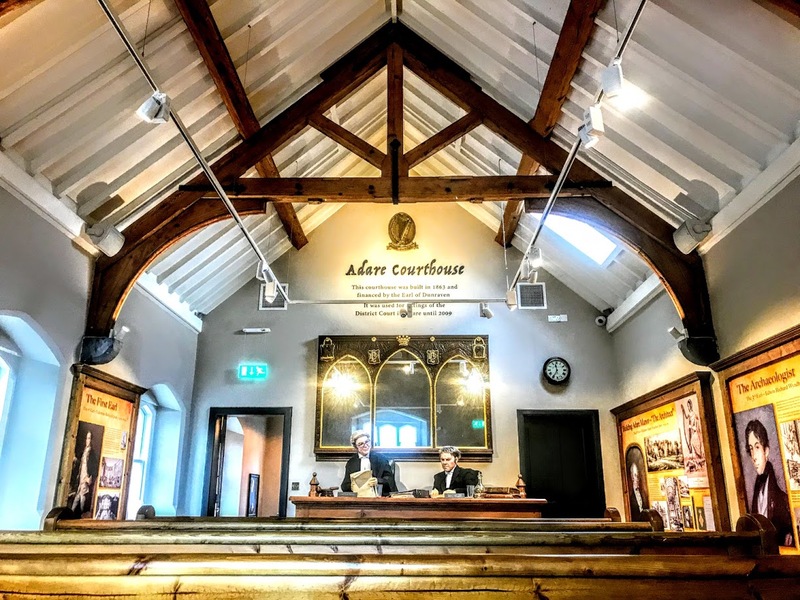 Upstairs, in the former courtroom, you can imagine yourself in the old courthouse, with striking, life-like representations of Judge Cyril Maguire and District Court Clerk Maurice Fitzgibbon. The courtroom and the stairs are lined with presentations on Adare Manor and biographical details of successive Earls of Dunraven. Edwin Richard Wyndham-Quin (1812-1871), 3rd Earl of Dunraven and Mount-Earl, who built this courthouse, is credited alongside George Petrie with ‘laying the foundations of a sound school of archaeology’ in Ireland. He was involved with George Petrie, William Stokes, and other Irish archaeologists in the foundation of the Irish Archaeological Society in 1840, and of the Celtic Society in 1845.